Putmax with Bike Wheel Lights - Bike Lights with Motion and Light Sensor-Safety Tire Light for Kids Adult Riding at Night - 2ct Bike Spoke Lights by Putmax at Melon City Bike Club. MPN: Newie. Hurry! Limited time offer. Offer valid only while supplies last. Features: 1. Instantly improve your safety with our bike wheel lights set. Increase visibility, ensure your safety when riding at night. 2. 1. Instantly improve your safety with our bike wheel lights set. Increase visibility, ensure your safety when riding at night. 2. Interesting design: Different riding speed, different pattern effect shown. 3. Cool variety of patterns alternately change. It can flash 30 different kind of patterns, patterns will be changed every 4 seconds All passers-by will envy you. 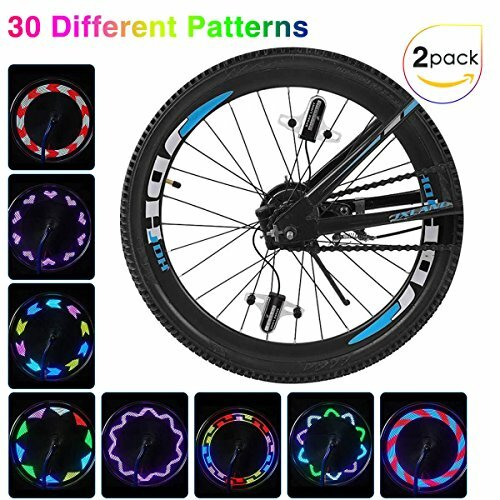 ♥ Easy to installation: These bicycle spoke light are easy to install on different style bicycle. Such as mountain bike, foldable bike, road bike and so on. Fit wheels size from 12" toddler bike all the way up to 27" adult bicycle. No tools needed. ♥ Portable: The cool LED bicycle rim lights with two work modes: Steady and flash, you can changed the mode by switch button. Waterproof and compact design, let you no need to worry about the weather and weight when you are going to riding. Operates on 3*AA batteries ( not included). ♥ As a gift: The bike wheel string lights is multi colored sets with 20 lights. Perfect for kids and adults alike. Also a good gift choice for friends, family members and everyone your loved. If you have any questions about this product by Putmax, contact us by completing and submitting the form below. If you are looking for a specif part number, please include it with your message.